Meteorological Fall begins on September 1st, as it does every year (the date of astronomical Fall changes, but meteorological fall is defined as September, October, and November for record-keeping purposes). That makes this a good time to look back on Summer, which was a warm and wet one around Minnesota. NOTE: This data was updated Sept. 2nd to include final numbers through the end of August. Temperatures were above the 30-year climate average across about 90% of Minnesota and all of Wisconsin this Summer season. Areas that were below average were only slightly so. Alexandria, MN experienced its 2nd warmest Summer on record (back to 1940), and Summertime low temperatures also averaged the highest on record. Duluth tied for its 7th warmest Summer on record (back to 1898). My friend Mark Seeley (Minnesota State Climatologist, retired) noted in his WeatherTalk blog that "for the May-August period this year ranks as the 2nd warmest historically, trailing only the growing season of 1988. And this is mostly thanks to very warm nights." Precipitation was far more variable across the states of Minnesota and Wisconsin, which is typical compared to temperatures. About half of the region received precipitation that was near or slightly below the 30-year climate average, and the US Drought Monitor shows a moderate drought ongoing across the parts of northern Minnesota. 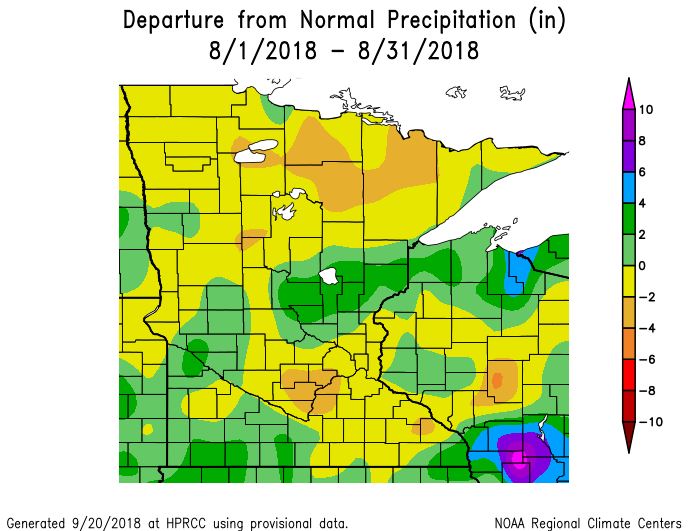 Parts of southwestern and central MN, however, were drenched with repeated rounds of heavy rain during June, July, and August. 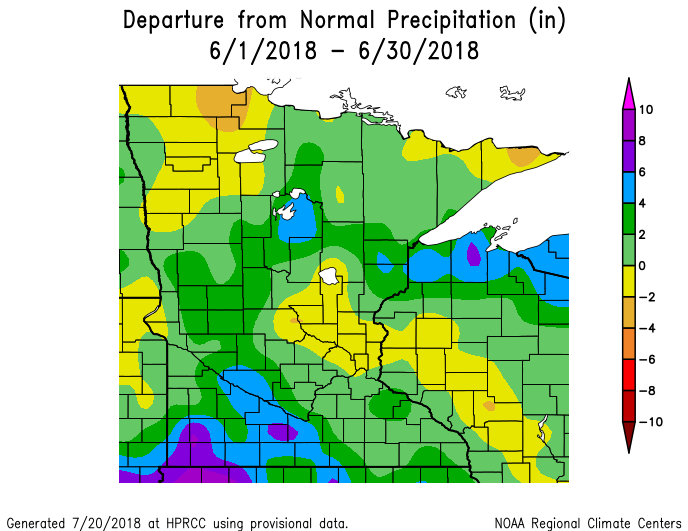 As the maps above show, parts of southern Minnesota received over 20" of rain in those 3 months, which is anywhere from a half-foot to a foot above average for that period. Several locations experienced one of their 10 wettest Summers on record including Redwood Falls (2nd), Moose Lake (4th), and Alexandria (6th). Hibbing, on the other hand, experienced it's 8th driest Summer on record. Tornado counts (preliminary, and subject to revision) have been below average all season long, based on Storm Prediction Center (SPC) climatology. From January 1st through August 30th, SPC shows that 15 tornadoes have been confirmed in Minnesota, and 14 tornadoes were confirmed in Wisconsin. In each state, respectively, average tornado counts by the end of August are 39 in Minnesota and 21 in Wisconsin; and, the below-average tornado season in the upper Midwest is part of a nationwide picture that also shows 2018 has been a relatively quiet year for tornadoes. 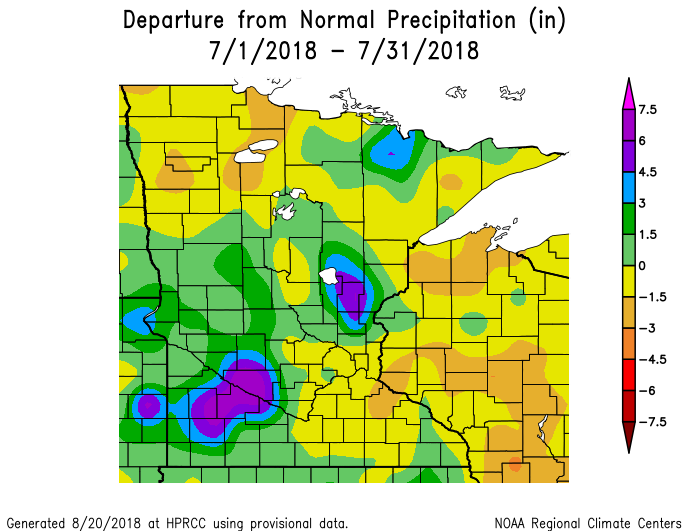 The Twin Cities Metro area had a relatively average Summer, precipitation-wise, with 11.05" of rain falling during the months of June, July and August; about 1.50" below average. That ranks toward the middle of the pack, at 40th driest since since records began in 1872. 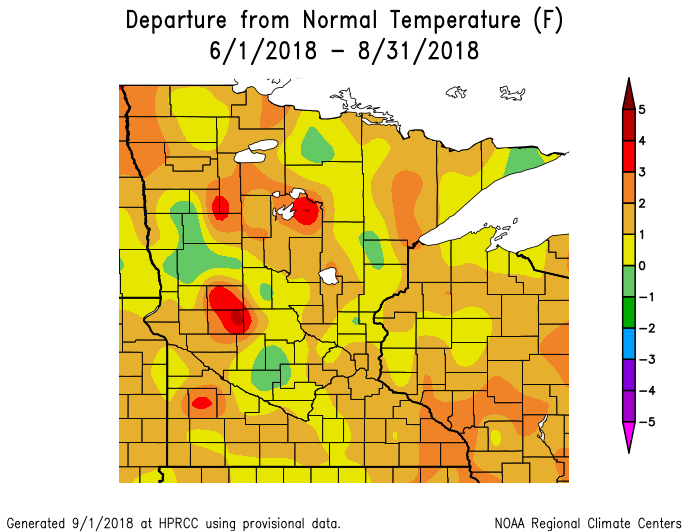 Temperature-wise, Summer 2018 was a different story in the Twin Cities. The average temperature in the Twin Cities during June, July, and August was 73.9°F; that ranks as the 10th warmest Summer on record, at 2.6°F above average. Expanding the scope to also include the hot month of May (and the earliest 100°F on record in the Twin Cities, on May 28th) yields the warmest May-August stretch on record. Overnight lows during Summer 2018, however, were the second-warmest on record in the Twin Cities, averaging 65.0°F for the season, which is 3.2°F above the 30-year climate average. Part of what drove these warmer overnight lows was a higher dew point, which is indicative of more moisture in the air. You might recall from middle school physics that water retains heat better than any other common substance; so, muggy, tropical air is hard to cool compared to dry air. While reliable dew point records don't go back as far as temperature records do, I looked at two measures of mugginess for Summer 2018, and both show that the Twin Cities had an abnormally uncomfortable season. I started by defining "uncomfortable" as any time the dew point reached an oppressive 70°F or higher. The plot above shows the number of Summer days each year, going back to 1945, where the dew point reached 70°F or higher in the Twin Cities. By this measure, there were 27 "uncomfortable" days during the summer of 2018; among the 10 least-comfortable Summers. This graph shows the number of hours each summer that the Twin Cities dew point was 70°F or higher. Hourly dew point records only go back to 1973 or so but, by this measure, 2018 was tied for the 4th most uncomfortable summer in over two generations. This Summer we saw some interesting streaks of weather in the Twin Cities, which also serve to highlight just how warm it was. For example: every day from May 13th through August 27th there was a high temperature of 70°F or warmer in the Twin Cities, for a total of 107 consecutive days. That's the longest stretch of 70°+ highs on record for the Twin Cities. There were 12 days of 90°+ heat during June, July, and August, bringing the yearly total to 18 days; slightly above the 30-year climate average. Another interesting streak: there were 43 consecutive nights with lows of 60°F or above in the Twin Cities; the 7th longest such stretch on record. If you're wondering what the Fall and Winter will hold, El Nino may provide a hint. NOAA has issued an El Nino Watch, which means there is around a 60% chance of El Niño in the Northern Hemisphere during the Fall 2018 (September-November). This chance increases to about 70% during Winter 2018-19. Historically, a moderate-to-strong El Nino pattern brings warmer-than-average temperatures to our region during the Winter. Precipitation (snowfall) is harder to forecast in an El Nino pattern, as Minnesota and Wisconsin have experienced both abnormally snowy and abnormally dry Winters in an El Nino pattern. The official NOAA seasonal forecasts for Fall and Winter (issued on August 16, 2018) call for a good chance of above-average temperatures, with no strong indication of whether precipitation will be above, near, or below average.